Skateboarding is an increasingly popular recreational activity among teenagers-especially young males and with the recent opening of the skatepark in the National Stadium it is high time that we get to know a little bit more about skateboarding. Ironically, this innocent and fun activity is often misjudge and are associated more with rebellion. Most people think of skateboarding as some sort of derelict type of thing where kids are just up to no good, but skateboarding is actually a healthy and positive thing for kids to be involve with; keeping them active and focus with responsibility, build confidence and social skills, most importantly it will take them out of the couch. Skateboarding activities also have direct link with visual art and graffitti. 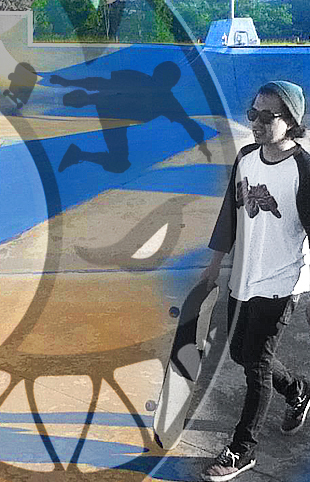 Bruneions had the chance to talk to one of the well seasoned local skateboarder who has also turn his passion into a business. Zairi of more familiar to his mate as 'Chom' is a man with little words but big skill and are known to be one of the most influential skateboarder in Brunei. Founded in 2002, Uneek Skateshop is not a new name to many local skateboarders. Previously in Kiulap, Uneek Skateshop has now relocated at The Souq in The Airport Mall. Uneek Skateshop provides all the essential equipment needed for those who seek the thrill of the urban sport of skateboarding. Owned and operated by Chom himself, Chom has made it a goal to represent the world of skateboarding in a fresh new light to the local community. Apart from selling skating goods, Uneek Skateshop provides services with boards and wheels, and 'Chom' gives personal insight and tips as well as letting his customers play a good round of Skate 3 on his PS3. What made you decide to create a skateboard workshop? I was interested in skateboarding since I was 12 years old. It’s difficult to find [skate] shops here in Brunei, where back in the 1980s the only way to find skate shop is to travel overseas either to Singapore or Europe. I guess there was one shop in Seria that sold skateboards but it was very expensive, and so I dreamt a lot of owning one skate shop here in Brunei that was affordable and easy to locate. Do you find there is a big audience in Brunei that are interested in skateboarding? Are there still many older generations who still skateboard? Yes, there’s a lot. Since there’s a new skate park that opened recently at the stadium [Hj Hassanal Bolkiah], I saw there were a lot of older skateboarders who came to skate again. Do you have a favorite skateboarder? Well I don’t have a favorite skateboarder but I have a favorite skateboarding team, the Baker Skateboard Team. What is the hardest thing about skateboarding in your experience? I would say, trying to learn new tricks and getting small minor injuries like sprain ankles. Yes I do. Most customers like to order boards and shoes because sometimes it’s difficult for them to find the correct size. Apart from that, I also do special orders for certain skate wax, belts, stickers, wallets, BMX handles and the complete bikes themselves, even surf boards but obviously I can’t sell them in the shop because it wouldn’t fit. What are the latest products in stock right now? I would have to say the Cruiser boards. These boards are different to standard skateboards because skateboards are used mostly for tricks whereas the cruisers are used for, well, cruising around. Sort of like a light transportation. I see you sell clothes too; does being a skater require a certain fashion? No, not necessarily but some people like to express themselves and there are many types of “skate fashion”. There are punk skateboarders, hipster skateboarders and metal skateboarders to name a few. I try to provide for all types of fashion although I have a pretty general selection of T-shirts, plaid button-down shirts, skate branded shoes and snapback caps. Do you sell many skate brands? Yes. I would say the most famous ones that customers seem to buy a lot of would be Time Machine and Death Wish. I have four skate shoe brands; Habitat, Fallen, Decline and DC. Though most of my customers prefer the Fallen brand. What do you think beginners should look for in terms of equipment? Well for beginners, they should look into different sizes of skateboards to match their height and foot size. Depending on how wide your feet are, the width of most skateboards is around 7.5 to 8 inches. It can be wide or narrow but if you have larger feet, get a wider board. Does the equipment require a lot of attention and taking care of? Most skateboarders tend to change the grip tape on the board, it wears out a lot if it’s always being used. I provide service to change the grip tape and also help to change the bearings in the wheels. Sometimes they can break or rust and make the board go slow but that often happens in skateboarding. What plans do you have for Uneek in the future? I would like to expose skateboarding more in Brunei by organizing competitions and events. Then hopefully going global by hosting them overseas. Separate to Uneek, I think the last skateboarding event I went to in Brunei was back in 2005 but since then I organized minor competitions. The last one was in June last year but hopefully I have time to plan another one soon. What would you like to say to skateboarders, young and old in the nation?